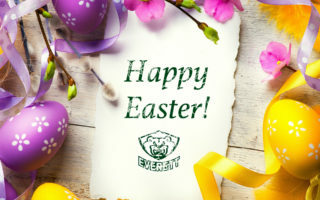 EVERETT, Wash. – CHL import draftee Yan Khomenko scored a goal and added two assists while defenseman Tristen Pfeifer collected three assists to help the Everett Silvertips improve to 3-0 in the preseason, via a 4-3 victory over the Portland Winterhawks at XFINITY Arena on Sunday. 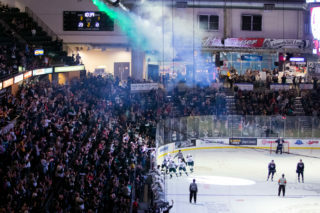 The Silvertips, who scored 13 goals in their three wins during their annual Preseason Classic presented by Holiday Inn Downtown Everett, built a 2-0 lead and rallied down 3-2 with a pair of power-play goals (2-of-6). Goaltender Carter Hart, making his preseason debut, earned the win with 33 saves. Carson Stadnyk scored twice, while Khomenko pushed his preseason-scoring total to five points in three games, leading the Silvertips. Everett controlled the pace in the opening minutes and seized a 1-0 lead on a beautiful finish by Remi Laurencelle, stationed at the right post with a set-up from successive one-touch feeds by Khomenko and Kevin Davis at 9:35. Stadnyk finished another spectacular play off the rush for a 2-0 advantage at 13:17. Pfeifer connected with Spencer Gerth on a long outlet pass to the left wing. Gerth, controlling the puck while entering the zone, whipped a rocket-like feed to the right post that Stadnyk deflected past Ethan Middendorf’s right pad. Hart showcased his return with a breakaway save on Caleb Jones, who took an outlet pass after exiting the penalty box late in the frame. But Portland got on the board with 1:38 remaining, down 2-1 on an Alex Overhardt wrist shot from the left circle. Portland then tied the game at 2:29 of the second period when Keoni Texeira connected with Carl Ericson on a breakaway, who flipped his first goal of the preseason over Hart’s shoulder. Overhardt followed with his second goal of the game, taking advantage of open ice after an injury to Alexander Scherbakov in the right corner, by walking out from behind the net and sneaking in a wrister from the base of the left circle at 10:20. 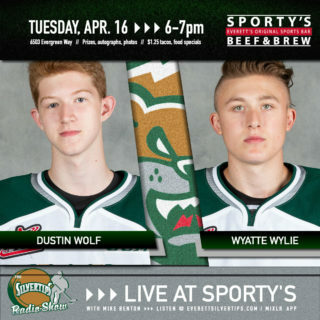 The Silvertips then made Portland pay for a too many men penalty and Stadnyk, setting a screen at the goal mouth on the power play, caught a piece of Pfeifer’s point shot for his second goal of the night and a 3-3 tie with 4:05 left in the period. Khomenko then buried his third preseason goal in as many games, on the power play, via a set-up by Connor Dewar and Pfeifer to the right circle for a 4-3 cushion at 3:57 of the third period. Hart handled his busiest workload in the third period and stopped all 14 shots. Counterpart Ethan Middendorf took the loss with 31 stops. 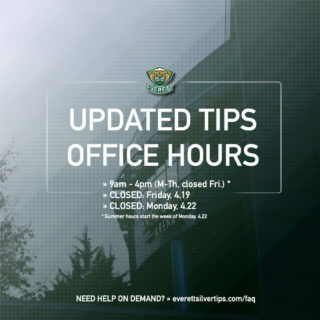 NOTES: The Silvertips scratched Patrick Bajkov, Dawson Leedahl, Riley Sutter, Matt Fonteyne, Sean Mallonee, Gunnar Wegleitner, Noah Juulsen, Cam Dykstra, Montana Onyebuchi, Mackenzie Dwyer, Jantzen Leslie, Tyler Fraser and Austin Lotz … Victoria defeated Tri-City in the Sunday opener, 5-1 and Seattle followed with a 5-2 victory over Spokane in the 3:00 p.m. matchup … Laurencelle, Stadnyk and Cole MacDonald, the three overagers dressing for the game, all wore an alternate captain’s letter … the Silvertips went 3-of-3 on the penalty kill and improved to a perfect 13-of-13 in the preseason. 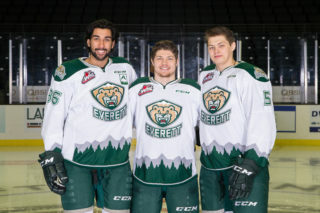 The Silvertips return to play for Tri-City’s preseason tournament, beginning Thursday against the Prince George Cougars at 11:00 a.m.